The Royal Botanical Gardens are just a short walk around the water's edge from the Sydney Opera House, as we had not yet been over this side of the city we decided to explore the 30 hectares of gardens. As neither of us are gardening fanatics nor remotely interested in plants, we were initially unsure whether we would enjoy the gardens however ... they were spectacular! 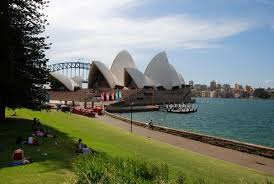 My favourite part was the walk round to Mrs Macquarie's Point. Walking along the waterfront the views of the Opera House and Harbour Bridge are great. I was even more impressed when I saw the horse statues! After our photo's at the point we decided to head around the corner to Mrs Macquarie's chair. I was surprised when I saw the "chair" as I had not expected it to be carved out of a piece of sandstone rock. Nevertheless the views from this vantage point were again spectacular. What I found surprising was how quiet the gardens were. Whilst you are so close to the CBD you feel as if you are a million miles away from any development. This area is also definitely the perfect place to picnic! After exploring the gardens we then decided to head to the Sydney Opera Bar (so that Marcus could get a pie). Please click on the slideshow below to see some more pictures! Hope you enjoy the pie soon Wobbs!! !